KOMSOMOLSK-ON-AMUR, February 8. /TASS/. Russia’s defense ministry plans to sign a contract for a preproduction batch of fifth-generation Su-57 fighter jets, Russian Deputy Defense Minister Yuri Borisov said on Thursday. "We are buying Su-57 jets for test combat use. First stage state trials are over," he told journalists. 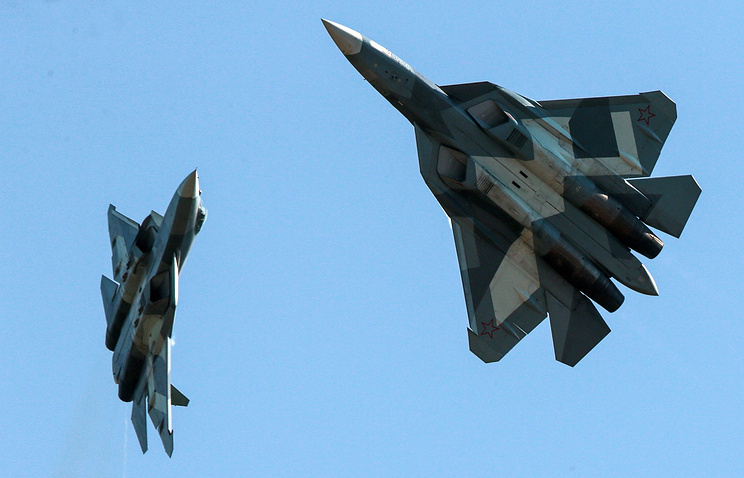 "This year, we will sign a contract for the first batch of 12 Su-57 fighter jets for the Armed Forces." According to Borisov, the first two planes of this batch may come into service in 2019. He said that ten out of 12 previously manufactured jets are undergoing flight tests. When asked about performance of the new engine for Su-57, he answered: "So far, it is difficult to say because there have had been only one flight. Everything seems to be all right. But you know, it is a series of trials. Many flights are to be performed. As a rule, such trials take two or three years," he said. The Su-57 (PAK FA) performed its maiden flight in 2010. On December 5, it made the first flight with a new engine. Currently, the plane is equipped with the so-called stage-on engine 117C. The new engine has been given no name so far and is conventionally referred to as "stage-two engine." It was reported in August 2017 that Russia’s the PAK FA fifth-generation fighter jet had received the serial index of Su-57. The experimental design work on the most advanced fighter jet should be completed in 2019 and its deliveries to the troops should begin at that time.